The Czech Republic's biggest construction company, PSJ will take part in the construction project of a city of artificial islands near the coast of the Caspian Sea in Azerbaijan, the Prague Post agency said on October 30. The value of the contract signed by the PSJ for its participation in the project called the Khazar Islands is estimated to be 395 million euros. PSJ will build four residential buildings. The company will start construction of the first residential building in spring 2015. "We have already signed a contract for one island, on which four buildings should be built," the PSJ Export Division Director Jaroslav Jirkovsky said. "We are now trying to secure funding for the first island which is expected to cost about 100 million euros." PSJ's income from foreign contracts made up 59 percent of the company's total revenue in 2013, which amounted to $198 million. The most important markets for PSJ are Russia, Slovakia and Asian countries. It was noted that the PSJ's contract in Azerbaijan is a good opportunity for the company to minimize risks from contracts in Russia and Ukraine resulting from tensions between the two countries. 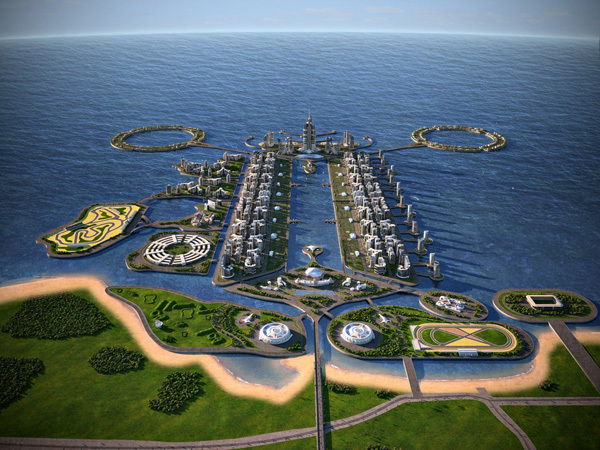 The new city will be located on the artificial island No41, about 25 kilometers south of Baku. The construction project has already started, and will be completed between 2020 and 2025. Khazar Islands, which is under construction on an artificial archipelago25 kilometers south of Baku, will consist of 41 islands of different sizes with a total area of 3,000 hectares on which 19 residential districts will be built. The tallest building of the planet, the 1,050 meter-high Azerbaijan Tower, will be built in the territory of Khazar Islands as part of the second phase of the project. The tower construction is expected to cost $2 billion. The islands will be dominated by high-rise buildings and resort-like accommodations, with miles of unspoiled beaches and warm, shallow waters. Special considerations were taken while designing the island's structures to withstand earthquakes with up to 9.0 magnitude power. So far, works on the project have been financed by the Avesta Group itself. The company hopes to reach an annual profitability margin of 10-15 percent on investments.